Arbor Brewing Company has been a hangout for university students for a long time. It became a pioneer in the craft beer industry since its inception in 1995 by a local couple, Rene and Matt Greff, who opened the doors of their pub and eatery in downtown Ann Arbor. The idea for ABC India started with Gaurav Sikka, a University of Michigan student and frequent ABC Brewpub patron. After graduating and returning to Bangalore, Gaurav contacted founders, the Greffs, with an interest in leading India’s emerging craft brewery movement. The Greffs made an exploratory trip to India and signed on as consultants to help build an Arbor Brewing Company modeled after the original ABC Brewpub in downtown Ann Arbor. The Bangalore brewpub, opened in 2013, is a 10,000 sq. ft. facility, capable of sitting 200 people. Under the agreement, all pubs opened under the ABC brand meet the same standards for quality, work environment, sustainable business practices, local sourcing, and community involvement, principles upheld by the Arbor Brewing Company. ABC India brews many of the same recipes produced in Michigan. Banglore residents can taste beers like Blonde, No Parking Pilsner, Michael Faricy’s Stout and the ABC flagship Sacred Cow IPA, renaming it Raging Elephant IPA for the Indian market. Peter, a salesman who is a frequent visitor at Ann Arbor brewpub, looks for a local brewpub even when on business trips. His main reasoning is that brewpubs often have outstanding food. When he arrives in a new town, he would seek them for food and a great, new beer. Another advantage of brewpubs is that unlike traditional restaurants, brewpubs are social establishments where one can relax, sample the local flavours and enjoy conversations with the patrons. Many business travelers enjoy brewpubs and the number of craft breweries and brewpubs has skyrocketed recently. According to The Brewers Association, there were 2,722 brewing facilities in the U.S. at the end of December 2013, an increase of almost 400 from the end of 2012. Rene is so passionate about products of her brewpub that she would point out her award-winning beers and foods that would be well paired with them. She pointed out that IPA, a classic American craft style, is their most popular brand that pairs well with classic American bar food such as pizza, nachos, burgers, or a corned beef Reuben. It won the best beer award at the 2011 World Expo of Beer. The Greffs also own a microbrewery in Ypsilanti, six miles east of Ann Arbor, where you can order food at an inviting place to hang out. On warmer days, they open their beer garden and when it’s chilly one can sit by their cozy fireplace. Ann Arbor with a population of 113,934 is home to the University of Michigan, a world-renowned institution of higher education, employing 30,000 people. 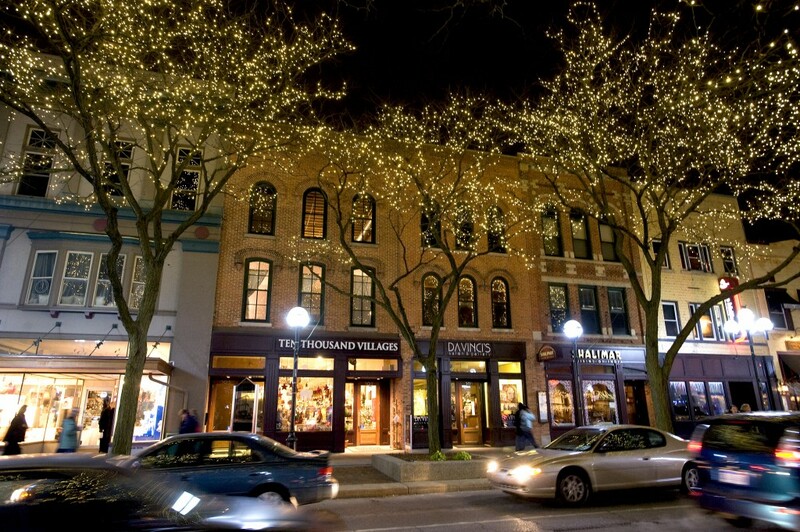 Ann Arbor has been consistently singled out as a high-ranking American city year after year in numerous categories by various mainstream media outlets. Among its credentials are 10 great cities for raising children, five great places to retire, top 10 college towns, America’s greatest main streets and best mid-west food towns. Another huge asset that Ann Arbor has is Michigan Stadium, nicknamed The Big House. It is the largest football stadium for the University of Michigan, considered to the largest in the United States and the third largest in the world. Officially, it can hold 109,901 but it can host in excess of 115,000. According to Wikipedia, every home game since November 8, 1975 has drawn a crowd in excess of 100,000. On September 7, 2013, the game between Michigan and the Notre Dame Fighting Irish attracted a crowd of 115,109, a record attendance for a college football game since 1927. It has also hosted hockey games including the 2014 NHL Winter Classic, a regular season NHL game between the Toronto Maple Leafs and Detroit Red with an official attendance of 105,491, a record for a hockey game. Later this year, the stadium will the venue for a soccer game between England’s Manchester United and Real Madrid – over 100,000 tickets for which have already been sold out. Real Madrid has won a record 32 La Liga and a record nine European Championships/UEFA Champions League titles. Madrid fans consistently pack the 80,000-plus Santiago Bernabeu Stadium in downtown Madrid since 1947. Ann Arbor is blessed with mild warm weather, which allows the area’s 300 restaurants to offer open air seating on patios. Those seeking culinary experience will definitely be able to find suitable dining to their taste buds. The area is also renowned for its cultural offerings, art galleries, museums, dance and theatrical performances. After visiting Ann Arbor, I can categorically agree with all the high rankings that have been bestowed on the city. * Mansoor Ladha is a travel writer, journalist and author based in Calgary.